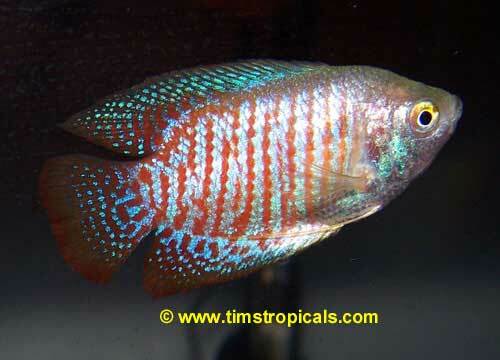 Dwarf Gouramis originated from India. 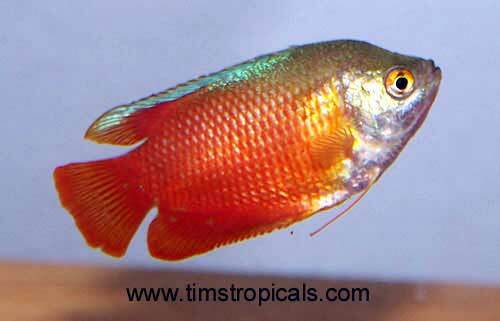 The original coloring for males was orange/red with iridescent blue diagonal lines. The red and blue basis has been bred into Cobalt Blue, Red and Neon Blue varieties. Females do not display strong coloring and are usually silvery grey. 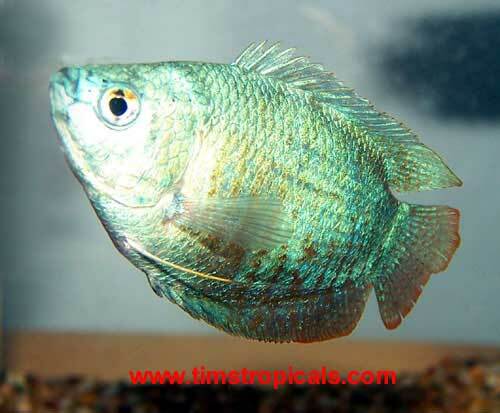 The Red Fire Gourami is often confused with the Fire Honey Gourami, but has more height, shorter pelvic fins and does not prefer the surface of the tank. Similar to the Betta and other anabantids, the Dwarf Gourami can breathe air directly and will frequent the top of the tank. Dwarf Gouarmis are peaceful and shy. The tank should be well planted and covered. Dwarfs should be kept in groups of 3 - 5. They will eat flake food, algae flakes and occasional live brine shrimp. When they are ready to spawn, the male courts the female with mild aggression and then builds a bubblenest among plants. After spawning only the female should be removed, as the male will tend the eggs. Several hundred fry can be expected. The male should be removed after the fry are about 3 days old. The fry are difficult to raise because of their small size. They should be fed infusoria and then brine shrimp.